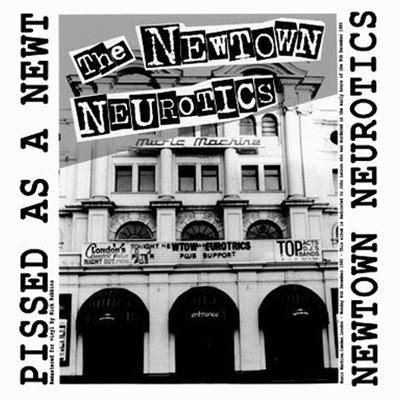 Newtown Neurotics have re-released a gem from the ‘80s. Pissed As A Newt was the first release from this highly underrated and increasingly important band. This album was recorded live at various locations in the late 1970s and early ‘80s. Locations included The Music Machine, London, Dane End Village Hall, Herts (August 1979), Harlow Town Park (June 1980)—among others. Originally a cassette, Pissed As A Newt finally sees the light of day as remastered vinyl by Nick Robbins. Newtown Neurotics are uniquely intelligent in their ability to weave together pop tunes with the urgency of punk rock. It’s a talent that is unfortunately overlooked in favor of meaningless drivel. This record is a great listen that captures the intensity of this highly underrated punk band. While others are flirting with nihilistic trends and self-destructive hedonism, Newtown Neurotics bring forth the revolutionary subversive nature found in the likes of The Clash or Joe Hill. They do this through catchy pop-meets-real-punk songs that comment on the sad state of society. This is particularly true in “When The Oil Runs Out” and the anti-violence song “Mindless Violence.” This band truly matters, and what they say is hugely important, especially in these dire times. There’s no better way to capture their true essence than through a record that boasts Newtown Neurotics unstoppable energy. As expected with any live recording, Pissed as A Newt a little rough, but luckily it has an enhanced sound thanks to the remastering. It’s also apparent that the lads in Newtown Neurotics probably enjoyed some of the notions that inspired Pissed As A Newt—aka rock n’ roll and drinks that influence a numbing down of intelligence. For all the now quite savvy types that means sobriety most likely did not play a part in the performances found in this record. Nevertheless, all the trappings of subversive rock n’ roll are clearly present within the grooves of Pissed As A Newt. The A-side is pretty raw. “Mindless Violence” is easily the most striking track on the A-side and “When The Oil Runs Out” the most distorted. The B-side of this record carries much of the charm found in the recorded sound of Newtown Neurotics. The opening track, “You Said No,” has a strong, subtly provoking intro. “Licensing Hours” is noisy and rowdy, as it should be. “Hypocrite” maximizes a certain electric charisma, while “I Get On Your Nerves” shows off their exciting desperation.